All right, OK, we get it: you survived the five-hour-long queue. You took your I-was-here selfie in a room filled with mirrors and sparkling LED lights that look like you’re in a bedazzled galaxy. Well, we’re here to say there’s more to The Broad than just the Infinity Mirrored Room and the 45 seconds you have in there to snap as many photos as possible. The entire museum is one giant spectacle and there’s so much more to appreciate. The influential Japanese artist and anime enthusiast has a giant 82ft colorful mural -- along with other great works -- in the first floor main room. You’ll likely find yourself staring at each panel of the mural for no less than 20 minutes because it’s like playing a giant game of Where’s Waldo? Keep looking and you’ll find rainbow-colored skulls, dragons, and even little pups in one piece and peonies and lions in another. We’re not exactly sure how those things relate, but it makes for one hell of a painting. 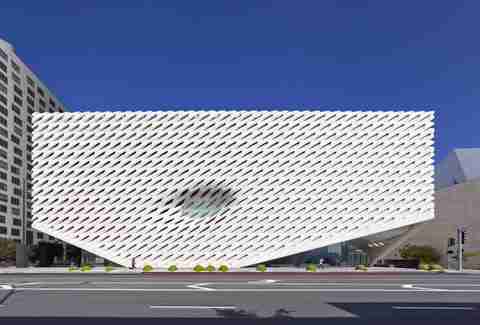 The Broad museum is a private art collection belonging to Eli and Edythe Broad who decided to build a museum as a home for over 2,000 works of art. Rather than create a secondary storage space for all the art not currently on display (like most museums), the unique “veil and the vault” design concept allows for the public to view said art through a vault that fills the middle of the building. While the art will rotate through the 120,000sqft building, you can catch a glimpse of the pieces in storage (the “vault”) and how they’re cared for through a glass window visible on the second floor. 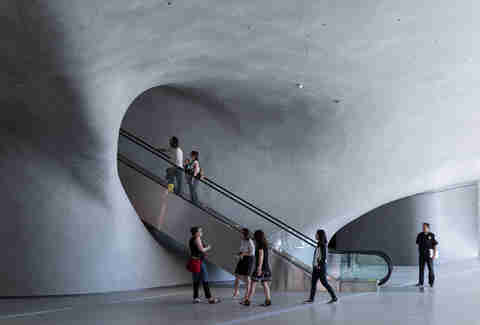 The “veil” or the honeycomb-like signature look and design encapsulates the museum’s vault on all sides and wraps the entire building which transmits natural lighting. 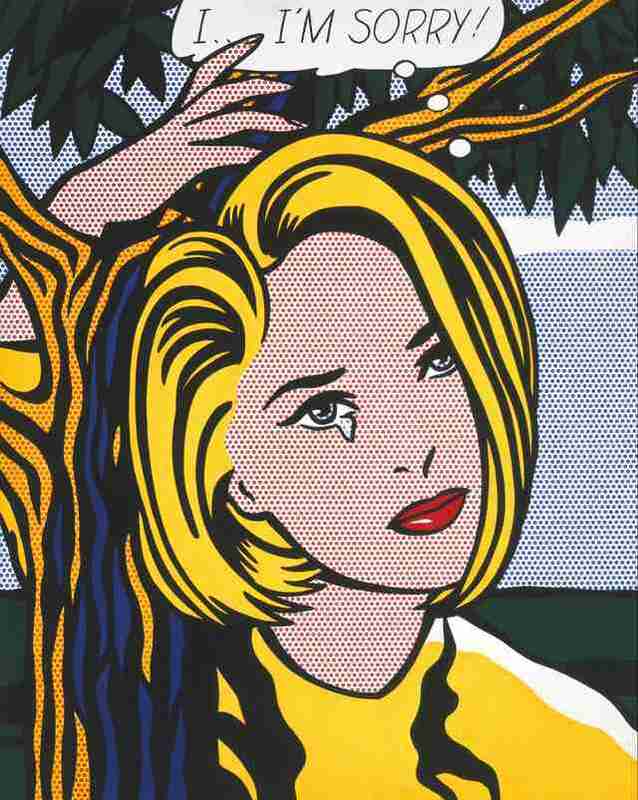 Roy Lichtenstein, one of the defining artists of the pop art movement, often used comic books as inspiration to develop a hallmark technique of hand-painted dots to create satirical characters and images. At The Broad, you can see some of his famous paintings like the I...I’m Sorry! or Mirror #1, which is an optical illusion -- so put away those phones, this isn’t another selfie-op. Courtesy of The Broad/The Andy Warhol Foundation for the Visual Arts, Inc.
Andy Warhol was also another leading figure in pop art in the '50s and '60s, creating some of the world’s most iconic and recognizable works like the Two Marilyns and Flowers, which happen to be on display at The Broad. 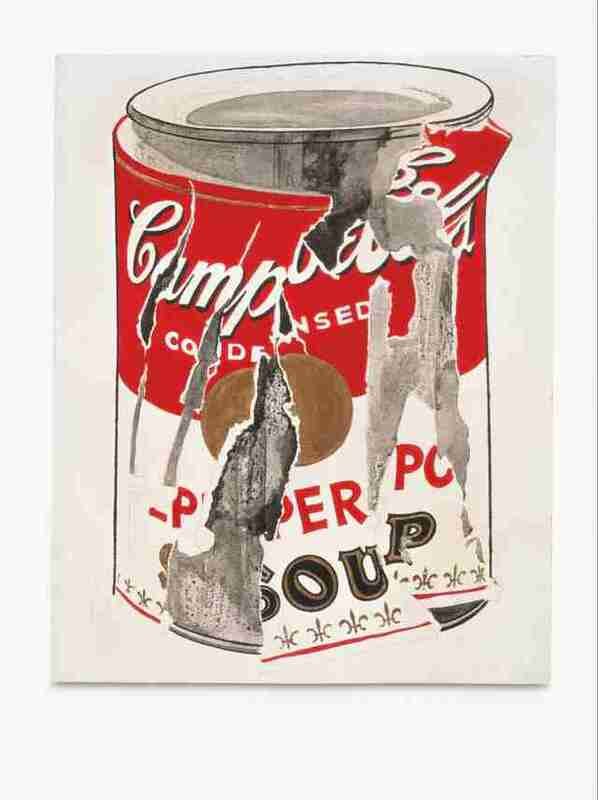 You can also scope out his famous Campbell’s soup silkscreen prints. Foie gras and funnel cake don’t usually belong in the same sentence -- like, ever. But somehow bougie and county fair food can co-exist in this brunch favorite at Otium (directly adjacent to the museum in the plaza). 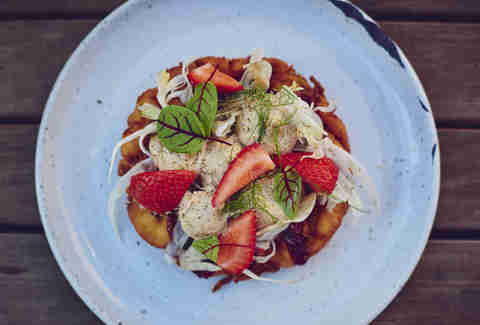 Dollops of foie gras mousse sit perfectly on top of a crunchy funnel cake, sprinkled with fresh strawberries and some other leafy things. Chef Timothy Hollingsworth (chef/co-owner of Barrel & Ashes) created this surprisingly tasty (and verrry rich) hybrid dish that you should probably try. In his first ever solo restaurant, the former French Laundry chef runs a contemporary restaurant to complement the neighboring museums, so don’t be surprised if your entire meal looks like an artist plated it. When you come up the escalators to the first floor, it’s hard to miss the over-the-top, shiny bouquet of stainless steel tulips in bright colors. The massive sculpture is just one of the many iconic creations by Jeff Koons, known for his highly reflective, playful pieces that are larger than life. He takes symbolic objects like balloons that clowns used to make for you at birthday parties and blows them up into giant art that makes you giddy all over again. Keith Haring, the artist whose work almost always had an underlying message (and expanded beyond the canvas), often tackled hot topics in our society like capitalism as seen in one of his untitled pieces at The Broad. Just look for the cartoon-like pig spewing money. The 24,000sqft plaza adjacent to the museum features a grove of Barouni olive trees that also served as inspiration for Chef Hollingsworth and the rustic, wood fire cooking at Otium. Two LA Guys Are Getting Local Uber Drivers More Money. Here's How. 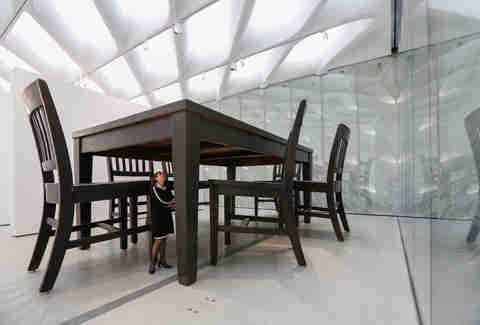 Probably one of the trippiest rooms at the museum is the one with the 10ft-high Robert Therrien Under the Table installation. No, you didn’t just walk into a scene of Honey, I Shrunk the Kids, but you will feel like you did. It’s basically a dining table for giants so unless you’re at least like 13ft tall, you can barely reach the bottom of the table. 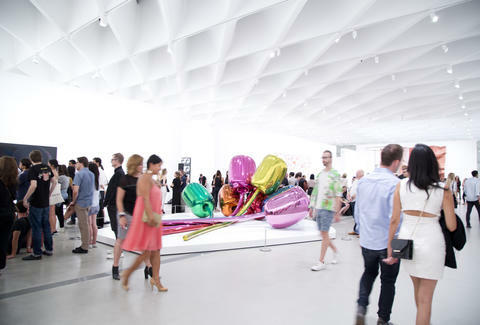 Download The Broad app (it’s free) and take an audio tour at your own pace. 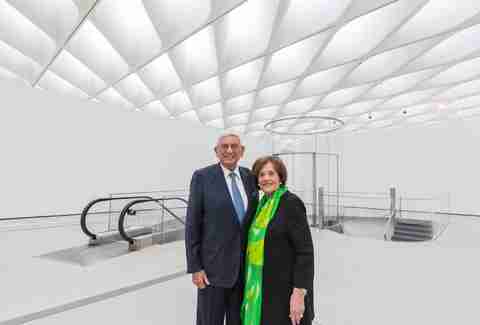 You can listen to commentary from the founders, Eli and Edythe Broad, get a tour from one of the partners of the architecture firm, and listen to a special “artists-on-artists” tour where they talk about the work of other artists on display. Test your fossil IQ and identify the dinosaur skeletons in the glass case created by British artist Damien Hirst (the same artist whose fish mural is painted on the far side wall of the Otium). After playing paleontologist, check out his canvas entitled Chlorpropamide (PFS) and see if you can guess which controlled substance the colorful dots are named after. Wait, actually, don’t do that. 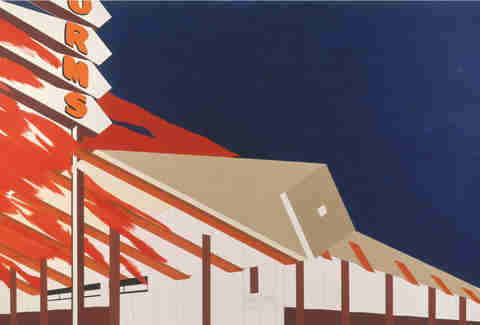 Artist Ed Ruscha became famous for his dramatic use of words, whether it was one particular word like Boss or a slew of them where he used colors and textures to emphasize meaning. But the artist also used quintessential LA symbols (and what could be more symbolic of LA than the orange and white sign of Norms diner?) as inspiration for his work. Once you get to the third floor, don’t forget to look up. There are 318 skylights which make up the “veil” across the nearly one-acre gallery space and provides natural daylight for most of the day, which also explains your perfectly lit photos. The entire first floor of the museum entails exhibits that are constantly changing like the new Creature collection which is over 50 works of art inspired by avatars and popular icons from artists like Andy Warhol, Takashi Murakami, Damien Hirst, and a special US debut of Thomas Houseago’s Giant Figure (Cyclops) that will all be ready for public viewing starting November 5th. And if you haven’t gotten enough of the Infinity Mirrored Room, you can come back in October 2017 for the exclusive Yayoi Kusama: Infinity Mirrors exhibit, which will provide not one but SIX infinity rooms for guests to experience. So, what we’re really saying is, you should reserve tickets for your next visit now, because there’s probably a new installation worth seeing. 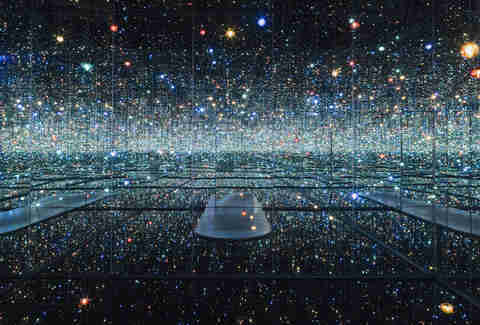 While Leila is guilty of taking a selfie in the Infinity Room (three to be exact), she loves spending a day at The Broad. Check out photos from her last visit on Instagram and Twitter.